Salt and Pepper Shakers are an item you find on every tabletop at every restaurant in america. 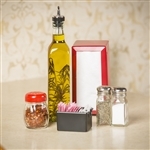 We carry a wide variety of commercial salt shakers and restaurant pepper shakers for your foodservice needs. 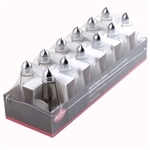 Our wholesale pricing on salt and pepper shakers is excellent since we have been the restaurant supply superstore for over 40 years. Don't forget your aluminum dredges for oregano and cheeses. Libbey Shaker Chrome Plated Plastic Top - 1.5 Oz. Gray Pepper Shakers - 1.5 Oz. Pepper Toast Peppers Shakers - 1.5 Oz. 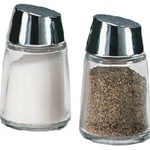 Salt and Pepper White Salt Shakers - 4 Oz. Tablecraft Dredge Set Beige Rose Yellow Lid - 10 Oz. Tablecraft Aluminum Dredge With Handle - 10 Oz. Tablecraft Stainless Steel Eiffel Salt and Pepper Shaker 1 Oz. Tablecraft Eiffel Tower Glass Salt and Pepper Shaker 1 Oz. Tablecraft Faceted Salt and Pepper Shaker - 1.5 Oz. Tablecraft Stainless Steel Top Glass Salt and Pepper Shaker 2 Oz. Tablecraft Stainless Steel Top Salt and Pepper Paneled Shaker 1 Oz. Tablecraft Stainless Steel Top Salt and Pepper Paneled Shaker 2 Oz. Tablecraft Stainless Steel Top Salt and Pepper Paneled Shaker 3 Oz. Tablecraft Round Glass Top Salt and Pepper Smooth Shaker 3 Oz. Tablecraft Stainless Steel Square Glass Top Salt and Pepper Shaker 2 Oz. Tablecraft Square With Mush Top Salt and Pepper Shaker 2 Oz. Tablecraft Perporated Top Cheese Shaker - 6 Oz. Tablecraft Slotted Top Cheese Shaker - 6 Oz. 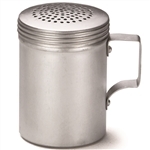 Tablecraft Stainless Steel Perforated Top Shaker - 12 Oz. Traex Salt and Pepper Shaker - 2 Oz. Traex Salt and Pepper Mushroom Top Shaker - 2 Oz. Update International Stainless Steel Dredges With Handle - 10 Oz. Update International Swirl Shakers With Perforated Top - 6 Oz. Salt and Pepper Shaker Glass Black Top - 1.5 Oz. Salt and Pepper Shaker Glass White Top - 1.5 Oz. Stainless Steel Top Salt and Pepper Shaker - 2 oz. 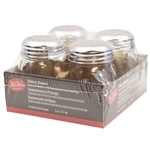 Chrome Slotted Top Polycarbonate Shaker - 6 oz. We have the best wholesale pricing on restaurant Salt and Pepper Shakers in the country. Having served restaurants for over 40 years, we have everything your restaurant needs including Salt Shakers.